OAK RIDGE, Tenn.—The Green Electronics Council recently announced ORAU as a winner of its EPEAT (Electronic Product Environmental Assessment Tool) Sustainable Purchaser Award. The award recognizes excellence in the procurement of green electronics, or those electronics that have been manufactured to conserve energy, eliminate environmentally sensitive materials and increase recyclability. ORAU was among 10 corporations that received a three-star rating, the highest possible rating indicating procurement of electronics in all three categories (PCs and Displays, Imaging Equipment and Televisions). 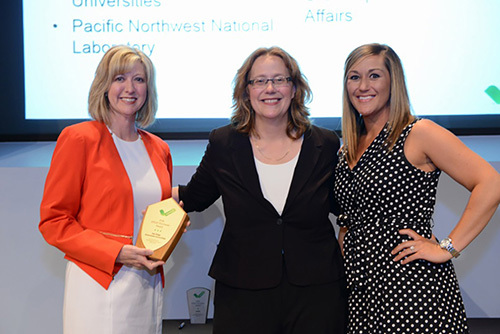 Cindy Snow (left), ORAU procurement manager, and Angela McConnell (right), ORAU contract specialist, were presented a 2016 EPEAT Sustainable Purchaser Award by Green Electronics Council CEO Nancy Gillis (center) during the organization’s recent awards ceremony. The award recognizes ORAU’s excellence in the procurement of green electronics. Click image for high resolution version. The Green Electronics Council works with manufacturers, governments, trade associations and environmental advocacy groups to evaluate and endorse environmentally responsible products. The EPEAT tool provides companies with a simplified way to purchase environmentally trustworthy electronics and to quantify their energy consumption reductions. In 2015, by purchasing EPEAT–registered electronics instead of conventional electronics, ORAU reduced its electricity use by nearly 173,000 kilowatt hours—enough energy to power 14 U.S. homes for a year—and reduced its greenhouse gas emissions by more than 31 metric tons—equivalent to taking 23 average U.S. passenger cars off the road for a year. The combined impact of this year’s 38 EPEAT Sustainable Purchasing Award winners resulted in more than $16.8 million in energy savings, greenhouse gas reductions equivalent to removing 29,786 passenger cars from the road for a year, and a reduction of more than 702 metric tons of hazardous waste. Visit the EPEAT website for more information. ORAU provides innovative scientific and technical solutions to advance national priorities in science, education, security and health. Through specialized teams of experts, unique laboratory capabilities and access to a consortium of more than 100 major Ph.D.-granting institutions, ORAU works with federal, state, local and commercial customers to advance national priorities and serve the public interest. A 501(c)(3) nonprofit corporation and federal contractor, ORAU manages the Oak Ridge Institute for Science and Education (ORISE) for the U.S. Department of Energy (DOE).